This quick, simple, South American-inspired recipe is low fat, low GI, and perfect for advance meal preparation. It's high in protein and fiber to help keep you satisfied and keep those snack cravings at bay. 1. Place the chicken thighs in an ovenproof dish and season with the salt and paprika. Cover with foil and place in a preheated oven at 220C (430F) for 30 minutes. 2. Steam the cauliflower until al dente. 3. Use two forks to pull the cooked chicken into strips. Add the coriander and mix. 4. 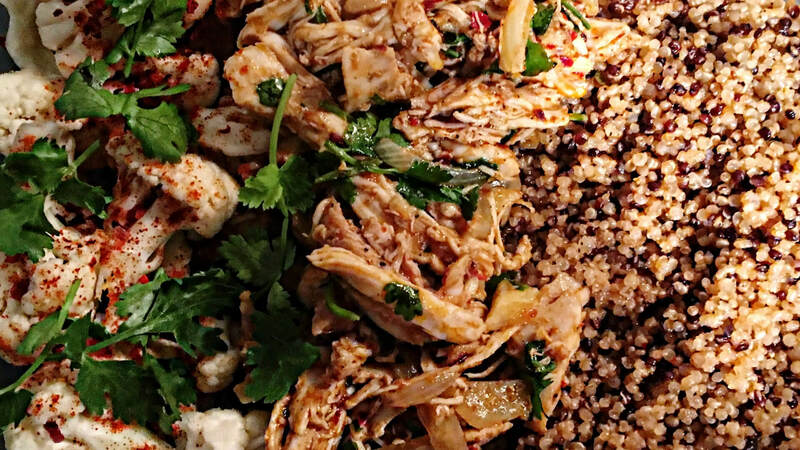 Serve the chicken with the quinoa and cauliflower. Enjoy!